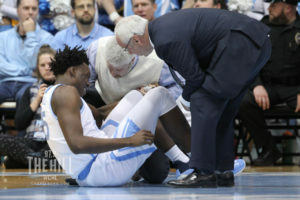 Despite a valiant effort through all sorts of adversity, the eighth-ranked UNC men’s basketball team came up just short in a true heavyweight battle on Monday night at the Dean Dome—falling 69-61 to the No. 4 Virginia Cavaliers. With Michael Jordan in attendance and the crowd worked into a frenzy for much of the night, the stars seemed as if they were aligned for what would have been UNC’s signature victory so far this season. 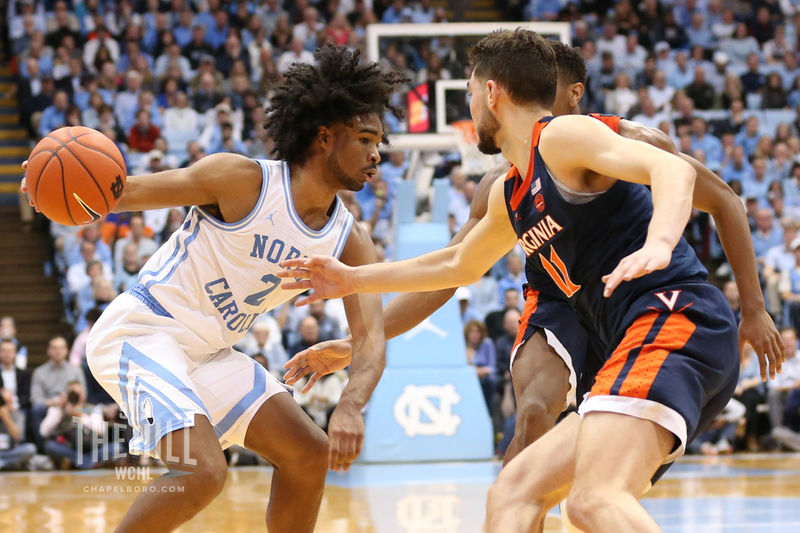 The Tar Heels (19-5, 9-2 ACC) struggled to find a rhythm early on against Virginia’s dominant defense and found themselves facing a seven-point halftime deficit—a margin that sometimes feels like 20 against a slow-paced team like the Cavaliers (21-2, 9-2 ACC). Still, though, UNC managed to battle back and take a seven-point lead with eight minutes remaining and it seemed like the roof could blow off the Smith Center at any moment. Guards Ty Jerome and Kyle Guy then carried Virginia on a 7-0 run to tie things up. The short-handed Tar Heels—who dealt with multiple injury issues in the game–traded baskets with their opponents over the next few possessions before freshman point guard Coby White appeared to sink a desperation heave from just in front of half court. What would have been a three-point UNC lead in the final three minutes was ultimately waved off due to a shot-clock violation, and momentum seemed to completely shift the other way. Head coach Roy Williams could only watch as his team scored just two points the rest of the game, while a pair of clutch three-pointers from Guy provided the difference for Virginia. “Their defense was better than our offense, and their offense was better than our defense,” Williams told reporters afterwards. “We had a great run for eight minutes, 10 minutes—whatever it was—and things were going our way. 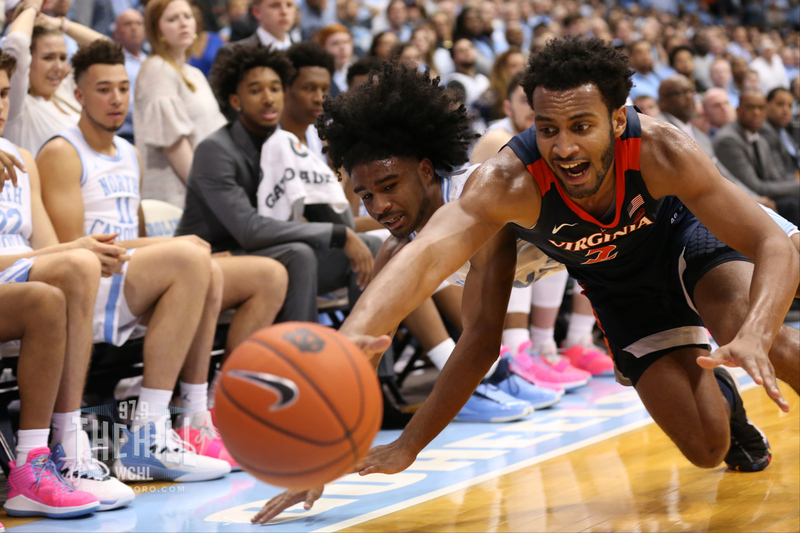 As well as Virginia played, though, holding UNC to just 35 percent shooting while making 53 percent of its own shots, it can’t be overstated how much fight the Tar Heels brought to the table. A sprained ankle suffered by freshman wing Nassir Little early in the game held the explosive sixth man to just two minutes of action. Senior forward Luke Maye was held to a season-low four points and was virtually non-existent all night long. And on top of all that, Cameron Johnson—who was second on the team with 16 points in the game—left the action for four minutes down the stretch with an undisclosed injury, just after Virginia had rallied to tie it up. This left UNC without many options to score the ball other than miracle plays from White and second-chance opportunities from Garrison Brooks. White’s 17 points led the team, but it took him 19 shots to get there. Brooks, meanwhile, had 12 points and was one of just three Tar Heels to score in double figures. And through all those negative factors, UNC still had a chance to steal the win. Speaking with the media after the game, Brooks had no intentions of making excuses for himself or the team—echoing the sentiments around the locker room that the Tar Heels let this one get away from themselves after White’s incredible half-court shot was disallowed. With Monday marking the end of a three-game homestand for the Tar Heels, they’ll head back on the road for their next game–which will come in Winston-Salem on Saturday against Wake Forest. That game is scheduled to tip-off at noon. This was the 10th time that UNC has played Virginia with both teams ranked inside the top 10 of the Associated Press poll. UNC has a 6-4 record in such games. The loss snapped what had been a seven-game win streak for the Tar Heels. Virginia is 21-0 against teams that aren’t Duke this season, despite having an 0-2 record against the Blue Devils. UNC’s 61 points as a team were the least it has scored in a game during the 2018-19 campaign.